Just outside the small village of Govindtola, near Navegaon Nagzira Tiger Reserve in rural central India, seven men are out on patrol. Wearing Born Free-branded uniforms, they’re on the look out for signs of large carnivores. 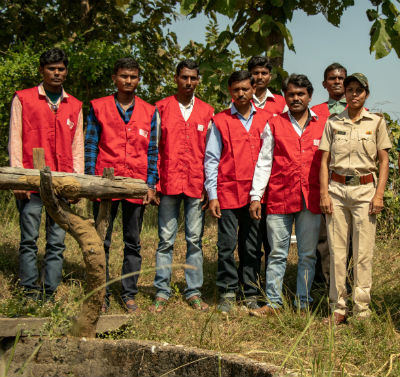 They are Govindtola’s Tiger Ambassadors – voluntarily recruited to protect and educate their community so they can live peacefully alongside wildlife. 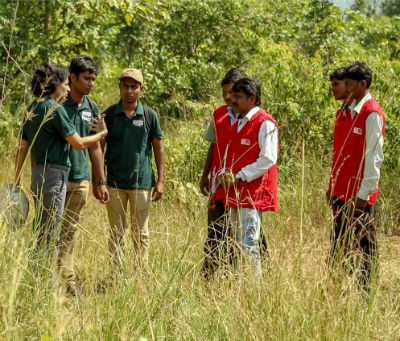 The team is one of 45 Tiger Ambassador teams created by the Tiger Research and Conservation Trust (TRACT), part of Born Free’s Living with Tigers programme. Established in 2014, the teams of five to seven men are trained to alert their community when wildlife in the area may pose a threat; manage and follow the correct protocols if there is a carnivore attack; and act as an anti-poaching unit. “The local communities in our landscape are one of our major stakeholders,” explains Poonam Dhanwatey, Co-Founder of TRACT. “There are lots of local communities living in the fringes of the forest, so their involvement and participation in protection and conflict mitigation is absolutely important. “It is very important for people to understand they play a role. This is where we got the concept of creating small primary response teams. Our Tiger Ambassador programme is all about creating leadership in local people to take ownership of their own safety from attacks by animals,” she adds. 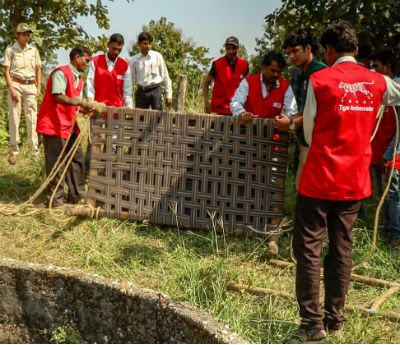 The teams are given extensive training in human-wildlife conflict mitigation and attend regular community meetings on conservation. Each Tiger Ambassador is given a booklet in their local language which details information, help and advice on issues ranging from managing crop raids by herbivores, to what to do if they encounter a carnivore in a village building. There’s also lots of hands-on training, including how to rescue wild animals that fall into open wells. Interestingly, if the animal is safe and can climb, a ladder should be placed inside the well. If the animal may pose a threat to villagers, a bed frame should be lowered and secured just above the waterline for the animal to rest on, until the Forestry Department is able to release it safely. TRACT says the Tiger Ambassadors initiative is a success. Communities are supportive and proud to be Tiger Ambassadors. Crucially, there’s also been a decrease in human-wildlife conflict. With your generous support, Born Free can increase its efforts and expand initiatives just like our Tiger Ambassadors to protect wild tigers in India for future generations.